Advertisement Click to advertise with us! In my latest expansion of a hobby instruments I was contemplating getting a Cello again. I had picked up cello a few years ago in high school but a couple years ago I sold it. One of my favorite things was playing "jazz" cello by putting it horizontally on my lap and, playing the bass part of some pieces I know. Pretty neat picking the strings. Thus I was searching around for a new cello. But a few years ago I also was looking at adding the bass guitar. Now as I was thinking of where I would actually play the cello it dawned on me (nowhere !!) versus where I could play a bass guitar (about anywhere). Thus I have dropped the notion of a cello and am moving forward on a nice bass guitar. Now unbemongst to me my kids upon overhearing this were ecstatic. But now I am reading about how a different pin material can change the tonal aspect of the guitar. Go figure. All the different woods, pins, and so forth can affect all the little tonal nuances. But, upon watching the Discovery channel a couple weeks ago they reviewed "tone woods"
One of the interesting items I read was how ebony is rarely used as a tonewood. Coming from the material aspect of clarinets and such I found this interesting. In keeping with the "cello" aspect I am looking at a Godin fretless semi acoustic bass guitar. Fun !! At this point I know next to nothing about the bass guitar species !! The cool thing about guitars and basses is that they tend to be so inexpensive compared to woodwinds...consequently, I now have about 14 of them. Ebony is often used as a fingerboard wood, and with guitars that certainly has an effect on the tonal quality. Ebony is also superior when it comes to instruments with synth tracking, like that Godin bass you're looking at. Doublereeds.ca - my new oboe & bassoon reed website! First things first - these acoustic guitar basses will never keep up with a standard guitar when played acoustically. The bodies are just not big enough to get the job done. 2nd thing - the livelier it is acoustically, the more prone to unwanted feedback you will find it. Feedback supressors will only gain you an incremental increase in volume, and every little bit helps, but feedback is a fact of life. A good parametric EQ can help considerably, but the good ones are not inexpensive. Get yourself an inexpensive model to start off with. Odds are the kiddies will want to try out Dad's new toy and a $1300 toy can be easily "relic'd" by a moment of inattention. These DEAN basses seem reasonably well built with decent intonation and a fair acoustic sound. Their amplified sound (obviously) is more like that of a guitar bass, than a bass guitar - if you know what I mean. 4th thing - strings will make a big difference. Some folks will tell you you must put on flatwound strings for that "upright" sound. BS! It will never sound like an upright, just lose any definition and resonance - get a muddy sound which some seem to think a bass violin has. Education: the path from cocky ignorance to miserable uncertainty. The chains of habit are too light to be felt until they're too heavy to broken. Admin and all around good guy. Lightwave hybrid 5 - this bass through a stack of SVT 10s sounds the closest to an upright I have ever heard from a guitar. Between tunes at my regular Thursday gig: POS chinese thing they provide - beats lugging my upright out! Kawai 5 with a few modifications - my main gigging bass. The guitar player went off on a solo, and we had no idea where he went! Carl, the Godin basses are chambered basses meant to be played in an amplified context. They succeed very well at that, and are very resistant to feedback. I have the guitar counterpart, the A6 Ultra. Chambered body with piezo bridge pickup and humbucker at the neck. Dual outputs, so I send the piezo through an LR Baggs Parametric DI, and the electric signal goes into my pedalboard, which ends with a Tech 21 Sansamp Blonde character pedal. The electric signal runs through a volume pedal, so I can fade it in to layer is with the acoustic signal. I run my guitar through a D-TAR equinox and then through a PF-500 into either an SVT15e or 1 or 2 SVT410he cabs depending on the venue. Often times I use a G30 wireless unit with it. I'm shopping for a smaller unit for coffee shop gigs. My Bassman has let me down 2 times and I need to find a more dependable compact setup. One that won't break the bank - or the marriage. I'm hoping Ampeg will do a single 10 cab in its Portaflex series, or even a 12 would be nice. That 2nd paragraph totally lost me .. all I understood was the "blonde" concept. I was originally interested in the Godin because a friend of mine bought a Godin years ago back when they were small(er) and it is made in North America. Now they have an entire line. I also wanted to start on the fretless, thus that took me out of the beginner series on basses. The "semi acoustic" aspect of it is curious to me though I'm totally clueless on it. But reading the material "The two chambered body design found in all of the A-Series instruments is also at work in the A4 & A5 Ultra. This design resists feedback as well as the negative effects that loud stage levels can have on top vibration." which reads good to me !! I also "assumed" that it wasn't totally acoustic in nature but required amplification. I've never seen - nor looked for a truly acoustic guitar bass until seeing Carl's post. FYI, I thought about the kid factor... they are getting a nylon string guitar before I get the bass. But the Godin is truthfully the price of a used eBay R13. And I could easily pick up a regular guitar or as Carl mentioned, a full acoustic bass for $200 .. The main question I have is that I have seen 4 and 5 string basses now. of course, why a 5 string ? I assume kinda like the Low A on a bari sax. On of my main problems is fused bones in my wrist which greatly restrict the span I have to cover a fingerboard. Thus going with a 5 seems like a "stretch" for me, and normally a painful one. Thus I'm going to stick with a 4 but I was curious none-the-less. FWIW, I cannot stretch on a 6 string guitar to reach the top string. When I was attempting to play guitar it was much easier to reach it with my thumb than my finger ... thus I don't play guitar. I also can't play violin/viola due to this problem. Flute is daunting & sometimes painful too. BUt as the instrument either becomes vertical (like a cello or sax/clarient) or more like a bass it becomes manageable. Of course I'm going to try playing a bass at the local store first and foremost to make sure it is comfortable. A 5 string (usually) extends the range to low B. This not only lets you play a few steps lower, but also lets you finger patterns a bit higher up the neck, where the frets are closer together. On a number of 5 stringed basses, the string spacing is also closer. About the only reasons for not getting a 5 string are price, and being used to a 4 string. For a new player, 5 string is the way to go. the only down side is having an extra string involved in string changes. Playability would be improved with someone who has issues reaching across the fret board, as the 4 strings of the 4 stings bass are closer to the side on a 5 string. What advantages/ disadvantages are there with going with an Acoustic, versus the Godin design , versus a traditional electric? I have no idea on the Godin versus any other brand / features / etc .. just that i was recommended to me from a Godin player. Of course price v quality etc. I assume those Deans are made in asia ? I want something to sound and play pretty good too otherwise I would just annoyed ... speaking of which I guess I would also need a nice compact speaker/amplifier setup. I've often expressed the desire to play bass and/or guitar. Just never had the time. Yes, I'm the Artist Formerly Known as Saxpics. If you need me or just want to chat, e-mail me @ thesaxinfo-at-gmail.com. An acoustic - in theory - should require no amplifier for performance. With guitars this is so, but basses need a much bigger resonating chamber to be a practical tool for a performer. Look into a guitarron to see what the minimum body size to be useful comes to. The godin is designed to have the tonal characteristics of an acoustic without the sound reinforcement issues. They are well made and a fine choice. A traditional electric is probably the most durable option. Those chunks of wood are much less likely to fall apart if they should fall down a flight of stairs... They are also very available on the second hand market, often including an amplifier and cables and a box or two. Hit up the local craigslist to see what I mean. The Squier line by Fender is turning out some very respectable basses these days. The Classic Vibe and the Vintage Modified in particular seem to have very positive reviews. SX is also reputed to be quite decent for the absolute bottom dollar. The straight solid body electric is the easiest to amplify. You need to get fairly loud before feedback concerns arise. I have no first hand experience with the Godin, so I'll defer to Merlin. Acoustics can be a handful to amplify if you do not have appropriate equipment. Not to say it is hard to get a useful volume out of one with an amplifier, a small amp will do a beautiful job in a coffee house or acoustic jam session. Amplifying on a stage can be problematic. One of those Deans would be a great practice/jam rig. They have a very nice amplified sound, and if you have a small amplifier, you will be quite satisfied using it in an acoustic situation. I have had success with a small amplifier placed immediately behind me and aimed under the chair (touching the chair!). It is a very natural sound and the base of the chair seems to help in reducing feedback issues by directing the sound out front. Hit up a Guitar center and feel up a few basses to see what kinds of string spacing and scale length works best for you. Even if you do not intend to use the lowest notes, I'd still recommend going with a 5 string whichever way you go, though a good low cost 5 string fretless is almost impossible to find. If hand span is an issue, then a 4 string, short scale (usually 30-32") would be a good choice. 5 string basses are almost always built with a 34 or 35" inch scale. Most people can play 1 fingers per fret on a short scale bass; when playing a long scale bass, this becomes more difficult. Both of my electric basses are Squiers. They're also both 5 strings. One is fretted, the other I defretted. +1 for going to a shop to try and hold some basses so you can feel the difference. As Carl mentioned the Squiers have some very nice models in the lower price range. Feel the difference between a P and a J bass, the latter having a slimmer neck wich could just be enough to overcome problems with stretching. I play a 4 string Fender Classic '60 Jazz and it suits me fine for what I need it for. Nice bass in a nice price range. @Carl, take a look at the MarkBass CMD. The 121P (1x12) and 102P (2x10) are very nice, compact and lightweight. No comment from me on breaking the bank or marriage though. I'll definitely see if the local shops have a 4 string short scale fretless bass. I never really thought of the potential variations (like saxes and every other instrument out there) in everything. I forgot to add - a short scale fretless is a little less common of a beast. You may have to buy a short scale bass you like and have a luthier properly defret it for you. This is the only cheap, fretless shortscale I am aware of that has decent reviews. 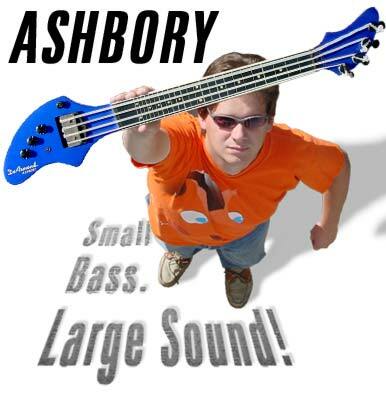 Then there are the novelty types of short scale basses - which are reputed to play well, but I don't buy it.